Mark Swain – friend of Leeds Book Club and writer of short fiction here – is a huge fan of the horror genera, and will be providing us with some reviews! This story is about the newly anointed pope who, in attending one final ritual, discovers the Vatican’s oldest and darkest secret. I would warn any person reading this review that it is difficult to discuss the story in any great detail without giving away the major secret which forms the main plot point. Therefore anyone wanting to avoid spoilers should immediately stop reading this and read the story and then come back to the review. Given this story forms part of a vampire anthology, is set in the Vatican and refers to frankincense in the opening paragraph its not hard to see where the author is going to be taking the reader with this tale. The ‘secret’ can be guessed by most readers fairly early on but this tale is not a Stephen King-esque twisting, turning yarn but the rather the personal journey of the pope in accepting what is put before him and also deals with the feelings of the vampire during his captivity. destroy him, this juxtaposition of ideals is at the heart of the story and I feel the theme is very well discussed without getting too involved in religious rhetoric. The author does go to quite extensive lengths to describe the look and feel of the Vatican in the story. This is incredibly important as the tale is quite short and takes place in small area. Getting this right is critical as the reader should view the environment as another character, especially for someone like myself who has never visited the Vatican. For the most part I feel the author does pull this off but at times get bogged down in unnecessary detail, my discovery that he has a Ph.D. in Byzantine History goes some way to explain this tendency for the over detailing. The one criticism I would have is that the story does suffer from some structural issues which makes it harder to read than it should be. The tale only involves 3 characters but the main storytelling switches from each of these characters very suddenly without much warning and can also slip back in time and then forwards to the present again with little explanation. This leads to the reader becoming confused on a couple of occasions as to who is speaking and from what perspective. I enjoyed Under St. Peters immensely. It is a very solid and, structural issues aside, well written tale. However the subject matter is an emotive one and anyone who has strong religious beliefs, particularly of the Catholic faith, should stay well clear of this. The author has not gone out of his way to be offensive but dealing with what this deals with it is easy to see how sacrilegious it would be perceived. 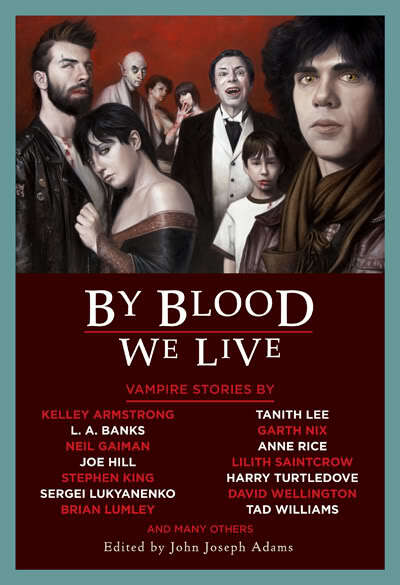 Under St. Peters by Harry Turtledove is available for free online HERE and is part of John Joseph Adam’s excellent vampire anthology By Blood We Live. Read more of Mark Swain’s writings here!